Field bindweed is a climbing or creeping vine that dies back each year. Its name derives from the way it binds or coils around other plants. The stems grow one to six feet long. The one- to two-inch-long leaves are spirally arranged and arrowhead-shaped. 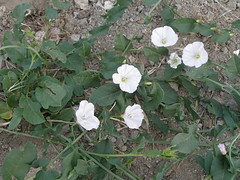 Although it produces attractive white or pale pink trumpet-shaped flowers, field bindweed is often unwelcome as a nuisance weed because it grows rapidly and chokes other plants. It is ranked as agriculture's twelfth most serious weed species. It reproduces both from seed and creeping roots, and is found in extremely diverse environmental conditions. One plant can produce up to five hundred seeds that can remain viable in the soil for fifty or more years. A deep, extensive root system allows it to sprout repeatedly from fragments and rhizomes following removal of above-ground growth. Persistent hand pulling or tilling or shading will help control this plant.